Summary: The dawn approaches as a group of survivors ready a fight for their homeland. And, the dawn is near as a former SWAT Kat runs to attempt rescuing he whom he lost five long years back. Comments: The finale of “Forgotten!” Wow… took me a while to compel myself into finishing this one. Now, I’ve got to kick myself into starting/finishing any other fics I have in my list. Ah, if only it were that simple. Oh well. Helion – thanks for your awesome comments in FF.N. Your question over the “scientist” that inserted the microchip into Jake’s mind will hopefully be answered here. I don’t know if it provides a well enough explanation, but you’ll have to see for yourself. ? Jennifer Munoz – Thank you so much for the great songfic you wrote for my second chapter. I do hope this installation gives you the same good read that your fic gave to me. I really enjoyed it! Dawameren I. – Thanks for putting up with the constant fics I toss at you via e-mail… and for putting up with my hairbrained ideas. “Don’t mock me,” were the first words that escaped Chance’s metallic lips once he and the Cybertron walked towards the main city compound. The Cybertron, in fact, didn’t say a word, but it did think that Mr. Wanna-Be-A-Bot was taking this whole issue on being metallic a little too far. For one, Chance’s incestant “beeps” and “cling-clangs” were getting irritating. Amusing, but irritating. “I am not.” The Cybertron paused, giving Chance that look again, the very look that he gave the tabby when he’d spoken to Jake for the first time back at Hackle’s. Beneath his metallic guise, the tabby froze. “Jake?” Once again, his heartbeat increased, as well as his breathing. “Feral and fifty of his men escaped the work camp…. I dunno. Maybe they can help you…” Jake was obviously not thinking of any danger to himself. “I….” The robot slumped a bit after that, silent. This act did not amuse Chance in the very least. “Jake…? ?” he tried, half afraid that his friend had logged off. “Jake! No, wait!” Once again, the tall kat grabbed the Cybertron by the shoulders. “You’ve gotta lead me to where you are!” No. Not again. Jake was NOT leaving without giving him a clue of some sort. Not when he’d gotten this far. “I’ll… I’ll download a map into Cybertron. Take care, buddy…” At that, he was gone. Feral was growing impatient. It had been hours since he’d sent his recons teams to the city. He waited within the swamps, each second muttering a silent prayer for an answer. Feral looked up quickly to see his niece running towards him, face worried. No. They couldn’t have fallen already. They’d barely set up the strategy. At that, Feral’s face lost a hair of its grim look. The robot made a squawking, offended beep in return. Geez! Did that robot get offended by anything non-metallic?! The Cybertron paused, making the map appear on Chance’s wrist display. “A maintenance access for the main headquarters….” Cybertron explained, and before adding anything else to its statement, shot a grappling hook upwards. “How far are we?” Chance asked. “We will get there,” the Cybertron replied nonchalantly. “I know I’m missing something… Something important.” He mused as he checked his systems. There was just…. Something was there! There had to be! Why was it bothering him so?! His thoughts were cut off as Mac stormed inside. Spinning around in his swivel chair, Jake faced the Metallikat. “FERAL? !” Mac repeated, flabbergasted. How…? How had the Enforcers made it this far? “The Feral that escaped from the work camp….” Jake retorted, in a tone that obviously indicated that he was surrounded by idiots. What was going on? Was he going crazy? What was the chip doing? What. Was. Going. On?! “It’s only one more,” the Cybertron returned. “Great.” Upon reaching the fortieth floor, he aimed his Glovatrix and fired the ice beam as the Cybertron indicated the opening it’d found. Shoving in the now frozen entrance, the Cyberton hefted itself through and then detached its cable, waiting for the disguised robotic kat to land beside it. “I shoulda had this thing a long time ago,” Chance muttered. Once again, the map was brought up on his display, the Cybertron indicating the command center… in the very heart of the building. Chance didn’t waste any time. He ran in that direction as the Cybertron followed after, looking for defenses. The systems abruptly alerted Jake to an irregularly moving object. “Huh.” He curiously brought it up on screen. For some reason, he didn’t know if he was supposed to be surprised, or even shocked. But, all he did was remain staring at the figure. Letting a faint smile curl around his lips, Jake simply leaned back against his chair. Then came the everlasting pain. A pain so similar to that of a head-splitting migrane. Screaming, he grabbed his head. The chip had just figured out what he’d been up to all this time. They were in hiding, waiting for the precise moment to strike… to hit the robots when they were their most vulnerable. The rebels knew that they were outnumbered. They knew that their weapons were unable to destroy the robots. They hid in their reserved areas until Feral gave his signal. Timing had been critical, and there was no room to make any mistakes. However, Feral *had* given the order to improvise *and* fire at will, so the outcome was unpredicatable. Taking in a deep breath, the once Enforcer commander stepped out into the clearing, blaster in hand, not ready to surrender. With a glare that clearly matched his last name, Feral stood at attention. Of course, he did expect them to laugh at his attrocious statement, but continued regardless. Behind him, Enforcers and volunteers held their weapons at ready. The time was near. Molly processed everything the taller kat had said. It was clearly *the* most ridiculous thing she’d heard the non-metallic say in the past five years, and her husband couldn’t agree more. The clicking sound of a single gun mixed itself with the swamp’s cricket chirps. One coming from the upper area of the trees. Where a once Enforcer sureshot lieutenant aimed carefully at the two renegade machines, her ears perked for her Uncle’s signal. She fired, the flash of the neural neutralizer encompassing the two robots. Abruptly, a flash of flood lights surrounded the clearing, blinding nearly everything to the naked eye, enough to startle the remaining army of robots present as their leaders fell to the ground. Feral’s order was carried out immediately. With a scream of both adrenaline and hatred, the precious few of what was left of MegaKat City’s defense force ran into the clearing, guns-a-blazing as they fired with everything they had towards the robots. They were taking their beloved homeland back, and there was no turning back. The swamp had obviously been the only area that the Metallikats hadn’t bothered searching all these years. But, that was exactly where they’d found the rebels. And, they took no time in attempting to bring the brigade of nonmetallic outlaws to their knees. But, with the resistance that the former prisoners were showing, this task wasn’t going to be carried out as easily as their robot minds had surmised. And, he watched the battle from the tallest and darkest tree he could find. Weak, hungry, he didn’t dare to move from his spot, curled up in a cowardly and tight ball of fur and skin. His florescent yellow eyes narrowed, his tail twitching. He wasn’t exactly rooting for either side to win. But, deep down, he did hope that the Enforcers would be the last ones standing. After all, this city was theirs, right? The city belonged to the felines. And, he was feline himself… Wasn’t he? He shook his head fiercly. *Half*-feline. Ever since the accident at MegaKat Biochemicals, his once golden yellow fur had dulled down to a nauseaous green. However, given his current condition, it may have had been a blessing. In his case anyway. A blessing, and a curse. Blessed with the ability to create life, cursed to run from those who attempted to destroy it. He sighed as the battle continued, willing the memories to leave. Memories. Memories of his alliance with Dark Kat and the Metallikats. Memories of capturing the SWAT Kat Razor the very day they’d formed the alliance. Memories of combining Dark Kat’s technology along with his ability to create a creature strong enough to hold down the hollering kat as the chip was inserted. Memories of torture, pain. Memories of encountering the SWAT Kat’s partner. Memories. Those green eyes narrowed into dangerous slits behind the tabby’s mask. Being grabbed by the collar. Facing the larger SWAT Kat’s fury. Memories of helping the smaller SWAT Kat understand his duties towards the alliance. Memories of Dark Kat’s betrayal. Of the Metallikats turning in on Dark Kat before the purple monster could react. His escaping into the swamps hoping to never be seen again. Hunted down by robots as his once robotic partners wished him dead. After all, he could not ruin their ruling. So many memories now gone. Driven into the back of his mind. He perked his ears at the sudden shouts of joy and victory. At the shouts of the nonmetallic rebels. Meekly, Dr. Viper slithered from his tree and crawled through his swampland. It was time to retire. The Cybertron beeped vaguely. Just how would the small bot know when the Enforcers were arriving? Surely Chance Furlong knew better. The smaller robot had just indicated an area just beyond the hallway, but for the first time it’d miscalculated. Beside both the robot and nonmetallic vigilante, a wall flew open. And, from within, it revealed Jake Clawson, sitting at his command center, wired up to just about everything surrounding him. Chance skid to a stop and froze, eyes mesmerized at the sight of his smaller partner, mind flashing back to the day he’d encountered Dr. Greenbox when the scientist had merged with his protocol, Zed*. And, Jake’s appearance hinted the same madness that Greenbox had shown him. Once amber eyes were lost in a sea of redness, a hint of sanity within them. Jake’s fur was incredibly rugged, the smaller kat thinner than what Chance had last seen him. And, his tone of voice was completely different from normal. Jake’s bloodshot eyes narrowed towards the Cybertron as Chance realized what it meant. “The chip,” the tabby growled. In response to the Cybertron’s obvious statement, Jake sent out a barrage of small attack drones, aiming them towards the smaller robot. Chance fired a few rounds with his Glovatrix towards the drones, the Cybertron itself firing a few rounds with the only mini blaster it had. At the rate this was going, Jake mused, there was no way of bringing those two to their knees. So, he called for something more formidable. The smaller kat had obviously taken notes from the Zed incident. ** Wired tentacles shot out at his command, grabbing onto Chance before the tabby could react. Chance squalled in return, barely turning to see Jake’s smirking face. Little did either kat realize that the Cybertron, even if it was pinned under the tentacles, managed to activate his link to Jake. His last ditch programming. An extra ace up its sleeve. And, in turn, it sent a wave of memories. Flashbacks. Stories of long ago. An eruption of pain flew across Jake’s head. And, the more he shook his head, the more the pain came. Whimpering, Jake held his head, the voice now multiplying, echoing whispers surrounding him. Weakly, the cable finally let go of his captives. Chance freed himself of the metallic armor. Everything, that is, except the Glovatrix. “I…” Jake began, hands gripping his head tightly. “I came here to help you, Jake,” Chance said, attempting to unhook the slimmer kat from his cabled restraints. In turn, the smaller kat simply ignored him, not stopping him. Reassured, Chance disconnected Jake from his weapons connections, the smaller kat slumping in some relief. “Jake? Can you hear me?” the tabby asked again as he removed the remaining cables. A faint mumble came back in reply. However, no sooner had Chance managed to help his partner up to his knees than Jake abruptly pulled away, snarling in pain. “My head…” He snarled again, his eyes flashing a crimson red. “I will not…fail!” Growling, he tackled Chance barehanded. The blood-red eyes. His partner’s cold and revenge-thirsty attitude since the very beginning. Flashbacks flooded Chance’s mind as Jake continued to struggle. The fall of MegaKat City, rumors of the backstabbing that ended up with two of her rulers dead or missing as the Metallikats in the end took control. However, Chance knew that one of the robot’s targets was smarter than what they’d expected. *He* was always anticipating, waiting for the right moment to show that he’d known what his enemies were planning. Like *he* knew that it would somehow end up with *his* own purple fur skinned. That was it. The ugly truth. Chance had just realized that the chip wasn’t only a device to awaken the desire for conquest within his partner’s mind. It was a home. A home for an evil and misbegotten spawn of hatred. The closest to the king of the underworld that Chance had ever encountered until the Metallikats proved an even bigger obstacle. His worst enemy had taken over his best friend’s mind. A fresh snarl erupted as Chance pinned Jake to the floor even harder. “Get him out of my head!!!! !” Jake cried. “I….” The single worded sentence was said softly as the caramel kat fought for control again, his partner chanting words of encouragement, like a coach at a football game. Jake’s face shifted several times, expressions changing. From pain, to anger, to hatred, to sadness. But, getting a torment such as Dark Kat out of his head was more than what he’d bargained for. He just couldn’t…. “CHANCE! GET IT OUT!!!! !” His voice was choked, desperately begging his friend to help him. In return, Chance couldn’t think of anything else but to call the Cybertron for help. “How do I get it out? !” he demanded. The smaller robot merely “blinked.” “That would require surgery, ChanceFurlong… It is embedded.” Curious, it cocked its head at the distraut expression on Chance’s face, then turned to Jake. Finally, in a quick move, it linked itself to the outlet of the chip and to Jake. [JakeClawson, can you not channel the chip’s programming into my own?] it asked, drowning out any other noise from the outside so only Jake could hear it. From the outside, Chance could only take a wild guess of what was going on. The expressions on Jake’s face told everything. Once again, a soft “I…” escaped from the smaller kat, his expression now set on concentration and determination. And, the Cybertron stood nearby, waiting and ready. And, from within Jake’s mind, the battle for conquest was a raging war that the caramel kat was fighting with the remnants of his strength. Dark Kat wasn’t about to go down that easily. However, what with being disconnected from one of the primary sources that kept him “alive,” the purple demon’s strength was just as low. [Don’t you dare, SWAT Kat!] he snarled in vain, as if expecting Jake to let go altogether. A snarled “Nooooooo!!!!!! !” echoed as Dark Kat was sent into the link, where the Cybertron was standing ready. In a flash, the smaller robot caught the demon and shut down its program, wiping his hard drive. Then, it was silent. A silence that Chance couldn’t bear to take anymore. “Jake…?” he whispered. And, in return, Jake slit his eyes open, once again in their ever so familiar amber color. “It’s over…” he whispered. “He’s out…,” Jake confirmed. His eyelids drooped, the smaller kat both mentally and physically exhausted. At that, Chance looked over at the Cybertron. “I told him not to,” Jake whispered, depressed. But, Jake couldn’t move. This time, rather than being exhausted, he was crying. Crying for Cybertron, shedding tears for his haggard, prematurely aging friend, for himself, for everyone he hurt. He was just finally crying. Something he couldn’t do for the past five years. And, all he could do was just let his once lost best friend engulf him in a bearhug. A welcome and yet very overprotective bearhug. The embrace didn’t last long. Chance had barely lifted his head to suggest they leave when he saw the Enforcers barreling into the complex. And, he couldn’t help but go back to his nightmare. No. He couldn’t let it become a reality. Without hesitation, he planted himself in front of Jake, shielding him. Instead of the sniper, however, the Enforcers paused in their tracks, blinking, confused. And, leading them was Commander Feral. Wait. A. Minute. “How’d you do that? !” The tabby was rather shocked, but there’d been enough surprises for one night. He just couldn’t deal with all of them. And, with that, Feral only smirked. Somehow, Chance doubted that Feral was seriously gloating. Instead, he followed him out of the fortress, hoping, praying that Jake was alright. Restoring proper order had been a lot harder than Feral had expected, but at least it could be done without having to worry about renegade robots aiming laser guns at his head. He gazed towards the city from his now remodeled office in what once was Metallikat HeadQuarters. He watched as the squadrons took off in neat formation, the choppers circling close by to return civilians back to their homes. Yes, it would take time. But, at least, MegaKat City was free of any strain that’d held it down for so long. He remembered the battle. His men had barely managed to take down what was left of the Metallikat Forces. They were lucky, however, when the messangers to Katskill City returned with reinforcements in time to boost their attack. Not to mention that the ‘informer’*** that had mobilized Katskill Forces the night the Enforcers escaped had given them the exact coordinates. The Enforcer Commander had been relieved when he’d received a call from Deputy Mayor Calico Briggs as she among others were transported back to MegaKat City. Her sending the Katskill troops had been a blessing. She’d explained that the work camp guard had been recently paid for his services, promised a new life if he cooperated. Feral couldn’t complain. Not this time. His city had been recovered. 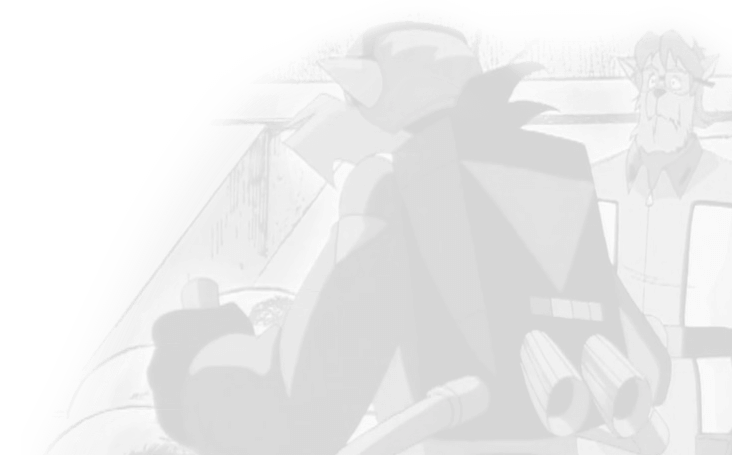 He had a speech to write for the new founded heroes of the newly recovered MegaKat City. Speaking of heroes, he couldn’t help but wonder what had happened to Furlong and Clawson. He hadn’t seen them since the raid on Metallikat HeadQuarters. Maybe it was time to reconsider their expulsion from the force. Of course, that would be up to them to decide. For the first time, Feral actually smiled. Chance’s tone was tired, but relieved. For the first time in five years he’d slept soundly, not waking up until he felt his body was fully rested. “Quite deep,” returned Hackle, polishing his glasses gently as they sat at the kitchen table. “But, the doctors seem to think the surgery was completely successful, although they did mention that he might have some memory loss. Hackle nodded, his frail eyes drooping to the table. “I’m already working on disassembling them.” There was a sad tone to his voice, one that had Chance lay a hand on his shoulder. “You’re welcome, my boy,” returned Hackle with a small smile on his face. Jake was asleep in a tight ball by the time Chance made his way upstairs, snuggled into his pillow, a bandage covering the area where the chip had once been. Chance dragged a chair over and sat with the back in front of him, watching his friend, tired, but relieved. He paused to remember the operation, his carting Jake over to the nearest area where he could find a doctor. Asking that very doctor to perform a miracle – to save his best friend. Hackle taking him by the arm and telling him to relax. To let the doctors do the work now. All he could do was wait. He’d fallen asleep along the line, waking up the very next day, remembering, pitching a fit when he couldn’t find Jake until Hackle sat him down and told him to calm down. At that, Jake stirred, slitting his eyes open as he’d laid on the bandage and the area was still tender. Rolling over, he saw Chance. “Did this happen with Mad Kat?” Jake cocked his head curiously, memories flitting back and forth, mixed out of order. Chance only smiled and shook his head. “Metallikats, actually… managed to knock you out.” It wasn’t the whole truth, but the tabby felt half the truth was just as good. Jake narrowed his eyes. “Hmm…” He KNEW when Chance was lying, and after looking around carefully, he knew they weren’t in the garage. The Cybertron could only beep back happily. “Oh here, let me plug into the wall,” Jake joked. Ever so suddenly, Chance became alarmed. “I beg your pardon?” No… the chip HAD been removed. “You don’t HAVE a recharge switch!” Did he?? Half relieved, Chance paused, realizing his outburst. The Cybertron beeped indignantly. Neither was about to let Jake beat himself up over it. At that, the smaller kat grinned. “Okay, okay, you two. I’ll try not to beat myself up… At least not before breakfast.” A wry grin followed thereafter. He didn’t finish his sentence. Instead, he stood up best he could and grabbed his partner in a tight and thankful embrace. And, at that, the once tired and frustrated tabby held his tears from streaming down his cheeks as he returned the bear hug. Five long years. Five years of running, fighting, waiting, planning… they were finally over. It would take time to pick up the pieces, but at least the once crime-fighters were reunited. Who knew what came in the near future? No one in MegaKat City, at least. 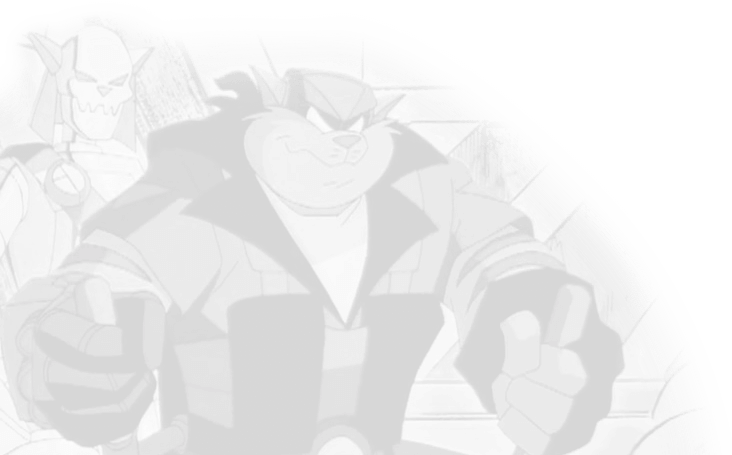 Perhaps it was time for the SWAT Kats to make another entrance. And, this time, stay for good until the very end.